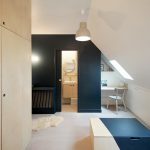 As regular Title readers will know, the conversion of miniscule Parisian rooms into self-contained apartments has become something of an artform in this most cramped of cities. And, while this clever attic conversion by Batiik Studios is perhaps not the most radical of makeovers. In fact, it does actually look like something we could see ourselves living in, rather than just a very fancy, well-appointed coffin. And that could present a few options for older unit blocks’s lofts – not just a sapre room, but a whole new apartment. 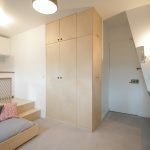 For, while living conditions in Australian cities are yet to become so cramped that the average walk-in closet suddenly becomes a viable rental opportunity, there are quite a few neat touches here for those wanting to make the most of what limited space they have. Take, for example, the sliding bed: it disappears completely under the raised platform, which is also the kitchen area, to create a wealth of floorspace, or can be pulled out halfway to become a sofa. With the bed tucked away, the backboard can support a four-seat dining table, with barstools on the lower side making up the inequity in height. It does however preclude any footsy taking place, something the French – so beloved of sexually-charged double-date dinners if the vast majority of their films are anything to go by – might take some getting used to. Even the bathroom divider has been cleverly cut away to create an “office”: a nook perfect for writing florid poetry or seething J’Accuse letters to neighbours keeping you up all night while they work on their own micro-apartment conversions. With plenty of natural light, and smart use of shade and texture, Batiik Studio have created something that looks chic yet functional, but most importantly of all, livable. Quelle surprise! For an even nuttier tiny apartment, have a look at this video.